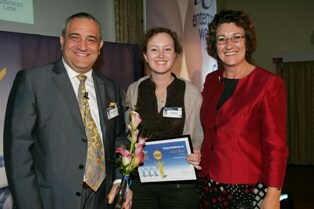 First Tutors was again nominated by Education Investor for an award announced in November 2011. We were awarded with a trophy for best supplementary education provider in 2010 and have been nominated again this year. These awards celebrate the achievements of the education industry and are judged by an independent panel of highly regarded industry experts. First Tutors won at Education Investor's award ceremony in November 2010 and picked up the trophy for best supplementary education provider (this category primarily includes private tutoring companies). These awards celebrate the successes and achievements of the education industry and are judged by an independent panel of highly esteemed industry experts. Anita Lee, Managing Director, took to the stage to collect the award: "We feel delighted to receive this award, particularly given it recognises our role in education. Whilst we are considered a dotcom business our primary passion is to facilitate helping people learn, so be recognised as a strong private tuition firm is particularly meaningful." Although unfortunately we didn't win this one, we were still very pleased to be a finalist! This award recognises "young British entrepreneurs and digital excellence". First tutors was one of four finalists, all businesses run by young entrepreneurs. First Tutors won twice at the Big Chip Awards, which celebrates the best of the digital industry. Judges remarked that, "A simple, effective use of interactive media to link tutors with those needing their services, the site was clear, the business model uncomplicated and the success obvious." We were very almost recognised for the ways we use of technology to join tutors with tutees!. We win an award recognising our role in helping families find tutors in a much more affordable way. In January of 2011, The Daily Telegraph officially described us as "respectable." In December Anita Lee, Managing Director, gave an interview to The Guardian regarding the rising demand for private tuition from university students. First Tutors identified a trend for undergraduate tutoring in subjects such as Maths, Law, IT and Economics. In March First Tutors was recommended by The Daily Telegraph in a seasonal piece about private tuition and the current trend for online tutoring. In July The Guardian ran an article recommending tuition as an excellent way to supplement your learning from home and recommended First Tutors as a good place to start! The Daily Telegraph also ran a story mentioning us in July, this time on ten ways to make money during the recession and recommending First Tutors for would be tutors. First Tutors has twice received a mention on BBC Breakfast television and Anita Lee, our Managing Director, has given interviews to local stations BBC Radio Cambridgeshire and BBC Radio Kent. First Tutors have also appeared within other articles in The Independent, Cambridge Evening News, several London magazines and, of course, the education press. We are also very proud to be recognised by The Good Schools Guide as a recommended place to find a private tutor. Tuition agencies must undergo extensive questioning before being listed in the guide.